Braille This transcription service uses the most up to date technology, in conjunction with the professional skills of a certified Teacher of the Blind to Braille/emboss and proofread your documents for accuracy in a timely and cost effective manner. 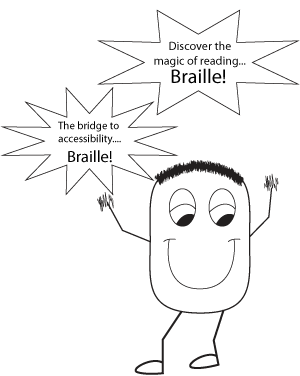 Meet school age and college level education goals by having print worksheets, homework assignments, reading materials and teacher made materials/ tests available in Braille format. Broaden your company clientele by having your print brochures, pamphlets, catalog, manuals or menu’s available in Braille format for your Braille reading customers. Meet Americans with Disabilities Act standards by having your specific materials (medical information, municipal/government information, girl/boy scouts, clubs, budgets, records, directories, manuals, forms, price lists and legal documents available in Braille format. Help maximize the Braille readers educational, cultural, historical, religious and leisure experiences/excursions (museum literature, church bulletins, theater playbills and miscellaneous information) with your service specific materials provided in Braille. Surprise your visually impaired or blind friend or family member by giving the gift of Braille such as: a letter, greeting card, birthday card, or favorite poem. Specializing in Teacher made Literary worksheets and Teacher made Literary tests.